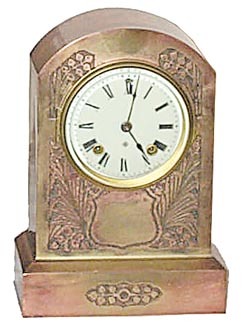 Ansonia Clock Co., metal cased mantle clock, "Blenheim", ca 1910. Case has a Colonial brass finish, 10 1/2 inches high, a lot of brass finish polished off, copper showing. One piece porcelain dial, heavy beveled glass, cast brass sash. Round 8 day movement, strikes a standing gong. Brass back door and bezel, correct pendulum, running. Ly-Ansonia No.1596.